I opt for flying in and out of Long Beach whenever I can. The costs for flights are comparable to LAX, it’s cheaper and easier to get to the airport, there is less time and hassle with check in and security and if there is a delay, it is fun to linger by the fire pit at the wine bar, enjoy the dining options or explore the history of the airport through the charming mosaic tile floor or photographic exhibits. Here are SEVEN GREAT THINGS that I like about the Long Beach Airport (LGB). Long Beach Airport is STRESS FREE! It may not offer as many flights as its Mega-Rival, LAX, but it is so easy to fly in and out of LGB. There is ample parking, a quick check in with short security lines and, best of all, it is close to home. You’ll save money and time on the road and at the airport and keep the blood pressure down. 2. Long Beach Airport is AWARD-WINNING! Fodor’s and Yahoo Travel named LGB one of the top 10 airport terminals in the world and USA Today gave Long Beach the top spot for Airport dining. The convenience was always there but now flying in and out of Long Beach is a first class experience. 3. Long Beach Airport is GORGEOUS! The recent extensive renovations, which in 2012 finished ahead of schedule and under budget, have left the charming 1941 structure with a sleek functional terminal behind the original building. The terminal which has both attractive indoor and outdoor areas is stunning and almost resort-like. 4. Long Beach Airport has DELICIOUS FOOD! Waiting at the airport isn’t bad if you are lounging at the fire pit at the 4th Street Vine Wine and Beer Bar with a cocktail in hand. Airplane food can be avoided by grabbing a quick snack at Polly’s or Sweet Jill’s or taking aboard something more substantial for your flight from Taco Beach Cantina, George’s Greek Café, or McKenna’s Burger Bar. If you have time to relax and enjoy a leisurely meal before your flight, try Boathouse on the Bay. See #2 above, the airport has won a food award! 5. Long Beach is adding SOUTHWEST AIRLINES!. Southwest is joining Delta, American and Jet Blue in Long Beach on June 5th with not one, not two, not three but FOUR flights to…OAKLAND! Why so many flights to Oakland? Are there a bunch of Raiders fans left in the Southland? How are they going to feel when the Rams take to the field to crush them in the fall? I personally utilize Oakland as my gateway to Napa Valley so I am not complaining about having more cost effective ways to head up Valley. Ask me sometime about my favorite wineries, restaurants and places to stay in Napa. You’ll worry about my liver by the time that I am through! 6. Long Beach Airport is pretty darn QUIET! Did you know that LGB won a rare exemption from a 1990 Federal Law that forbids cities from imposing noise limits around airports while it phases out older, louder aircraft? There are also curfews in place. The Airline fines help fund nonprofit organizations like the public library in noise affected communities and I know that the airlines are serious about avoiding the fines because I flew into Long Beach on a flight that had been delayed and the pilot was rushing to beat the curfew. He did, by about two minutes, but it was one of the world’s fastest airport approaches that I have ever seen or experienced or EVER hope to experience again! 7. Long Beach Airport has FREE WIFI! Which means you can work, catch up on Emails and even read this article and shop for houses on my web site at one of the many computer terminals or outside your gate. 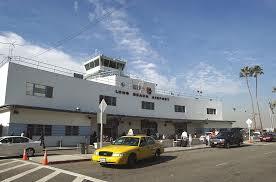 I know that you will be as smitten with Long Beach as you are with the Long Beach Airport. Contact me to find out more about Long Beach and buying or selling your home here and check out www.lgb.org to find out more information about the Long Beach Airport. Janet Darrow is a well-traveled Long Beach, CA based Realtor and Global Property Specialist with Keller Williams Pacific Estates who can always be reached via www.FollowDArrowRealEstate.com where you can follow her “House it Going? blog” or catch some of her growing YouTube video library about Long Beach on her Janet Darrow Realtor channel. She is always happy to assist with your real estate needs where ever they may be..
Marina Home: Can I just Move Into this Store?